Jackie Goldberg, left, will face Heather Repenning in the runoff election on May 14. 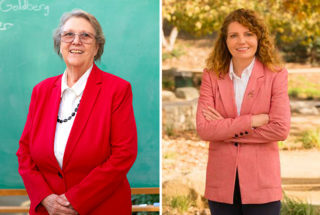 Former L.A. city official Heather Repenning and teachers union-pick Jackie Goldberg are officially headed to a May runoff for L.A. Unified’s Board District 5 school board seat, as the county registrar certified the March 5 primary results on Friday. Goldberg had been leagues ahead of the race’s nine other candidates since election night, finishing Friday with 15,935 votes — 48.18 percent of the 33,074 total ballots cast. While the 74-year-old’s status as a former board member, vocal charter critic and union ally during January’s teacher strike granted her substantial name recognition, she was unable to clinch the more than 50 percent majority needed to win outright. Repenning, a 44-year-old district parent and former aide to Mayor Eric Garcetti, a week ago had already declared herself in the runoff election. But she formally secured second place on Friday with 13.13 percent of the vote, a slim 31 votes ahead of Huntington Park councilwoman Graciela Ortíz. This count was unchanged since last Friday, because the six straggler ballots that were counted this week went to Goldberg, a county spokesman confirmed Thursday. As of Monday, Ortíz had not conceded or decided whether she would request a recount. Her team is waiting for answers from the county registrar — whose offices were closed Monday — regarding concerns such as under-votes, or ballots that were submitted but weren’t filled out, campaign manager Sergio Carrillo told LA School Report on Monday afternoon. “We’ll be reviewing those [ballots], and once we feel comfortable we’ll make a decision,” he said. The decision could come as early as Tuesday morning. A full recount of the more than 33,000 ballots cast could cost in the ballpark of $27,500 to $30,000. Ortíz’s campaign has spent more than $40,000 above what it’s taken in, according to city ethics commission data last updated on March 5. Ortíz can request a recount through close of business on Wednesday. The county would then have up to seven days to start the recount. Under “optimal” conditions, it could count about 5,000 ballots a day, a spokesman wrote in an email. Results of a recount wouldn’t be known until early April. The runoff election is May 14. Whoever wins will join the school board as its seventh member — likely reshaping the majority on the school board, which now swings between reform- and union-leaning agendas — as soon as the county certifies the results. That certification date is tentatively scheduled for May 24, a county spokesman told LA School Report on Friday. Repenning and Goldberg’s runoff pairing ensures a white representative in Board District 5, known as BD5, where about 90 percent of the more than 80,000 students are Latino. 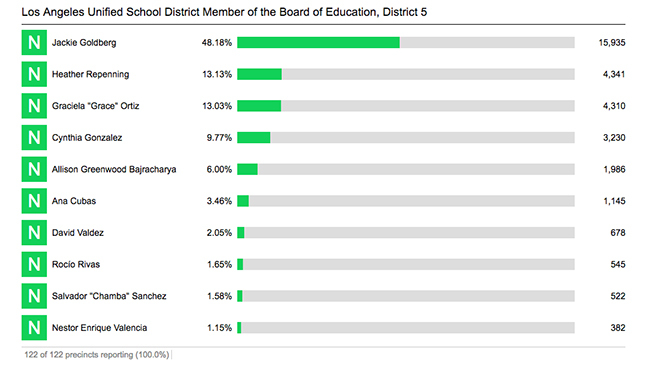 BD5’s students have been represented by non-Latino school board members for 16 of the last 24 years. They’ve also been without any representative since last July, when former board member Ref Rodríguez resigned after pleading guilty to money laundering charges. BD5 includes the southeast cities of Huntington Park, Maywood, South Gate and Bell, and neighborhoods northeast of downtown including Highland Park, Echo Park, Silver Lake, Eagle Rock and Los Feliz. There are more than 310,000 eligible voters in the board district, bringing voter turnout in the primary to about 10.7 percent, which is on par for school board elections. Heading into the runoff, Goldberg has spent about $175,000 of the $200,000 she’s received in campaign contributions, according to city ethics commission data last updated on March 5. United Teachers Los Angeles has separately poured about $670,000 so far into getting her elected. Repenning, the race’s top fundraiser, has about $9,000 left, spending about $278,000 of the $287,000 she received leading up to the primary. SEIU Local 99, a union representing education workers such as teachers aides and cafeteria staff, has doled out close to $1 million to elect Repenning. About $140,000 of that has gone toward opposing Goldberg. Charter advocate Eli Broad also gave $100,000 to SEIU Local 99 on Election Day, the Los Angeles Times reported. It is unclear at this point if the California Charter Schools Association Advocates — which stayed silent during the primary — will throw its support behind Repenning for the runoff. “It is critically important to CCSA Advocates that all voices are heard and considered throughout the endorsement process. At this time, a decision has not been made,” CCSA Advocates spokesperson Brittany Chord Parmley said in a statement Friday afternoon. Updated campaign finance totals will be available via this link on April 4, May 2 and May 10. Backed by UTLA, Goldberg was dubbed “the candidate to beat” during the campaign season, touting decades of experience from her previous positions as a 16-year teacher in Compton, an L.A. Unified school board member for two terms through 1991, a city councilwoman and a state assemblywoman. The Silver Lake resident told LA School Report her top priorities as a board member would include taxing the state’s “150 billionaires” and multimillionaires and pushing for more accountability and transparency for charter schools. Firmly backed by teacher union support, Goldberg would swing the school board to a more union-friendly majority. Repenning, who was endorsed by L.A. Mayor Eric Garcetti, is a former L.A. public works commissioner and Garcetti’s former director of external affairs, with more than 18 years of experience working in local government. She has also been a teacher. The Silver Lake resident told Speak UP in a January interview that she’s focused on boosting wraparound services for impoverished communities, getting more state funding for early education and adding a “parent perspective” to the school board. Her daughter attends a district elementary school. Come back to LA School Report on Monday for in-depth interviews with Goldberg and Repenning on their top priorities and strategies for the runoff. *This article has been updated with CSSAA’s statement and a statement from Ortíz’s campaign manager on Monday about a possible recount.